“Severn Wraithe” is an interesting little piece of Kim Holman history, and also a piece of Royal Navy history. Built by Nicholson and Marshall on Hayling Island in 1968-69, she was originally ordered by the Royal Navy Portsmouth Command and Christened “Sea Wraith“. She then appears to have been Registered on Part 1 of the British Ship Registry briefly as “Sea Wraith ll“. Official Number 338605; No. 113 in 1970, at Portsmouth. During this period HRH Princess Anne sailed on her and was in fact on board when the black&White picture was taken by Beken of Cowes. In 1971 Sea Wraith was transferred to HMS Mercury, and was renamed “Meon Maid lll“. She then had an interesting and active 15 year career with the Royal Navy, teaching matelots how to sail “a proper yacht” right up until 1985. During this period she travelled widely around European coasts, the Atlantic and the Med it appears. The above period of the boat’s history is still being worked on and anyone who was around in the Navy at Portsmouth or at HMS Mercury at that time (1970-1985), please do get in touch. (former Royal Navy personnel, in Particular!!) The boat must have been popular, to have been retained by the Navy for some 15 years, at a time when yacht accommodation and “conveniences” were developing rapidly into the modern “floating Caravan” syndrome. Since that point, the yacht’s behaviour appears to have been thoroughly dis”Grace”ful, with engine problems, handling problems, gear failures, leaky decks etc etc. Since taking over stewardship of this very classy lady, Kathy Kilbey has had to re-christen her “Severn Wraithe” (the original name having been taken on the part one register) and she has now been returned to the full British Ship register (June 2016). Interestingly, the lady is once again behaving herself – she underwent a full de-naming including full propitiation of the gods of the Sea (with due libations), which has been followed by a re-christening in her new part-one registered name of Severn Wraithe, port of registry, Cardiff. Based at Lydney Harbour on the River Severn “The Wraithe” is sailing to and from Bristol Channel ports very regularly. If you own or have previously owned or sailed on one of these boats please do get in touch with me (Kathykilbey). I am aware that several boats are on the West coast of Scotland and would very much like to contact these owners. The original Names of the Northney 34‘s built (from LLoyds Register of Yachts 1971): (there may well be others still unidentified) are listed below. Sea Wraith (Meon Maid III); Dingbat; Ballerina of Mizzen (Ballerina of Torbay); Hiboux II; Sannu-Sannu; Scintilla of the Sea; Spellbinder; Symbol of Lleyn; Lauric; Marazan; Mar Azul; La Bamba of Beaulieu; Osiris; Silver Tempest; Tarantara; Streaker; Dervish; and of course Kim Holman’s own original wooden yacht “Shaker” of 1965, from which the original mould and plug were taken. 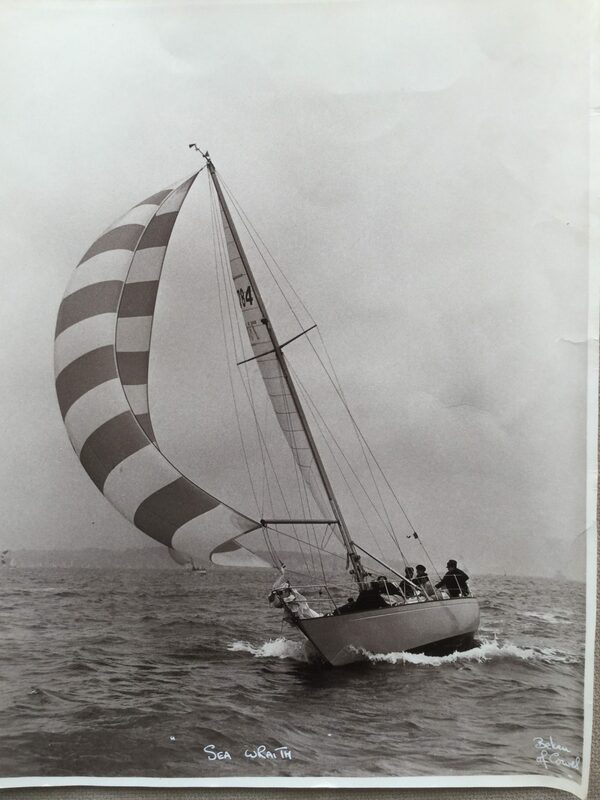 There are several missing so any one who owns or sails a Holman 34 of any kind please get in touch with us. This will be a work in progress, so please watch this space. I have a feeling this overall project is going to be a long job, as I am intending to gradually restore the boat whilst keeping her in commission all year round and sailing her as much as possible. So for the moment, excuse the varnish… or lack thereof! !